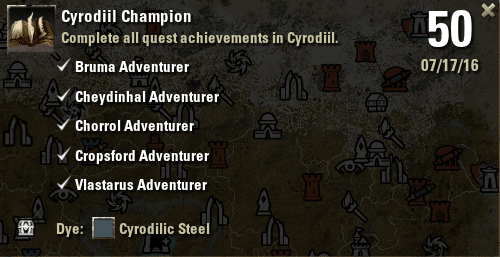 With the completion of the last Cyrodiil quest hub of Vlastarus, I completed the requirements for this achievement. With it, a new unlocked colour for the dye station. Previous PostESOTU Vlastarus AdventurerNext PostESOTU Tamriel Expert Explorer Achievement!